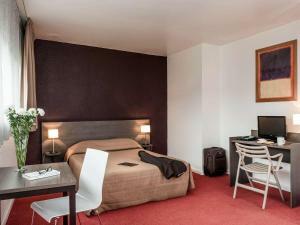 All of the contemporary apartments and studios at Aparthotel Adagio Access Paris La Villette offer a microwave and refrigerator. Each has a private bathroom with a bathtub, and hairdryers are available upon request. Guests can enjoy the buffet breakfast every morning and browse the free WiFi at the residence. Afterwards, the 24-hour reception can advise on a day of sightseeing. Charles de Gaulle Airport is a 20-minute drive away from the residence. Tourist attractions such as Galeries Lafayette and the Louvre Museum can be reached directly using the local Metro transport. Les Docks de Paris Event Venue are 2.5 km away. A baby cot is available at the reception for single and superior studios (upon request). Spacious studio for 2 to 3 people with a fully equipped kitchen with a microwave and refrigerator. Rate: € 87.00 ... € 171.17; select dates below to get current rates. Studio for 2 people with a fully equipped kitchen with a microwave and refrigerator. Rate: € 71.00 ... € 196.00; select dates below to get current rates. Spacious 1-bedroom apartment with a fully equipped kitchen and a seating area with a sofa bed.